Usually there is nothing to analyse when a race is added to the Ironman calendar, but Copenhagen is not really new. 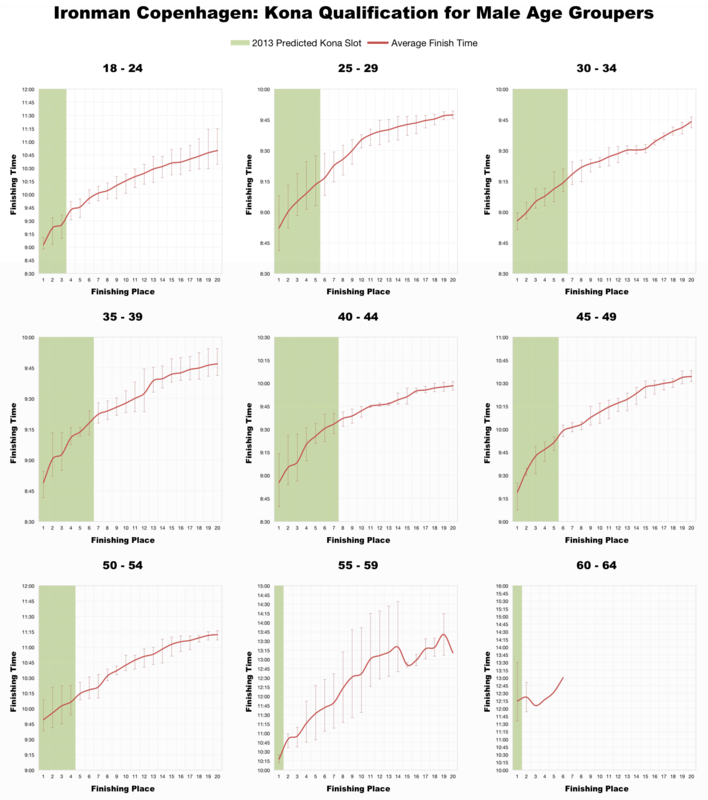 It comes with a 3 year history run under the Challenge banner and with that 3 years of results (kindly provided in Excel format by Challenge) which means I can produce all the usual pre-event analysis. Ironman may bring some changes, but those past results should give an indication of what to expect from Sunday’s race. 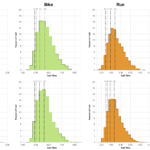 The distribution of splits from the last 3 years of racing shows a clear leftward skew and generally a narrow distribution of finishers which points towards a faster, more competitive race. 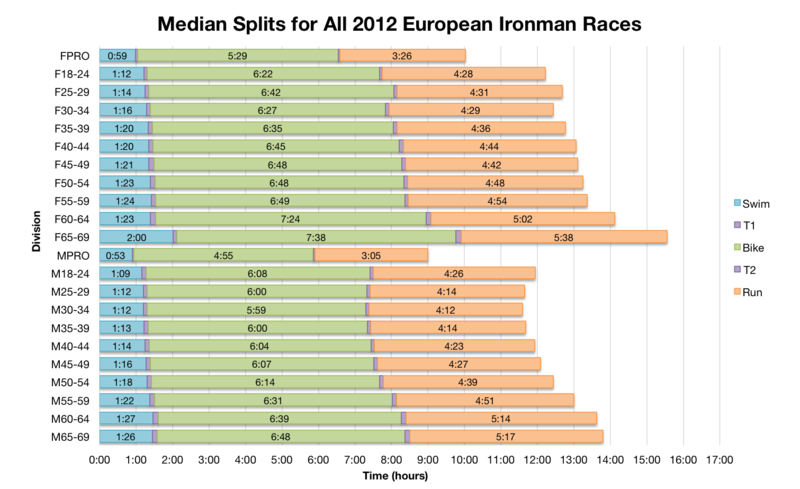 For comparison I’ve also produced the split distribution for all the European Ironman events of 2012. Copenhagen lies towards the leading edge of race splits, not dissimilar to events like Ironman Frankfurt or Austria. 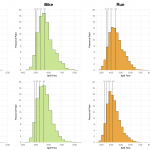 It does however lack the weight in numbers of it’s Ironman counterparts with the starting field typically below 1,500 athletes; this probably contributes to the narrowly spread distribution of splits. 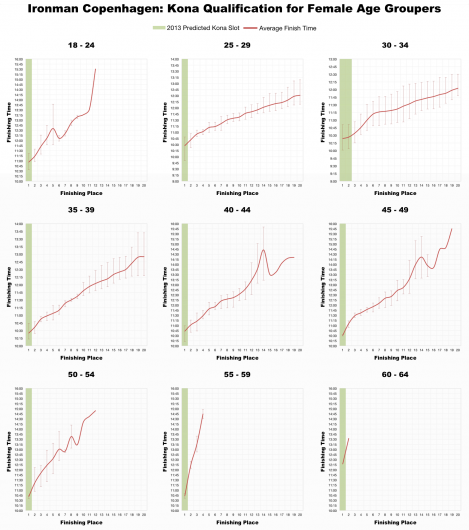 The median splits for the race are also quite fast. 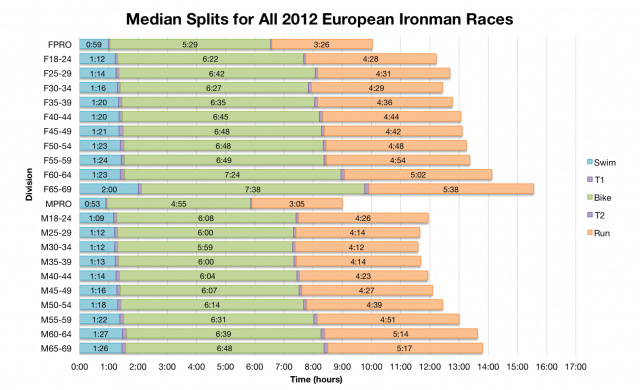 Comparing with the medians for all European races last year swim times are largely on par, bike times faster than average and run times also marginally faster. Of course races like Lanzarote, UK and Wales slow the medians in the full European chart, results from Frankfurt this year show more comparable times. With a larger field Copenhagen’s averages might slow, but in it’s current form it is clearly another fast race on the European circuit. 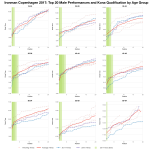 The provisional Kona slot allocations above are taken directly from the Ironman Copenhagen website. As usual it’s the 40-44 year old men who dominate the slots and most female age groups have only one slot for the age group winner. There is one addition to the usual divisions though – best supported. One of the 50 slots available will be given to the athlete judged to have had the best support on the day. I can’t make any predictions from the data for that one. 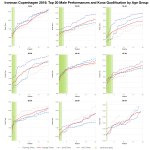 This is the first year Copenhagen will offer Kona slots, but the finishing times from the last 3 years still offer some guidance towards qualification. This is a fast race so naturally the qualifying times will be fast. 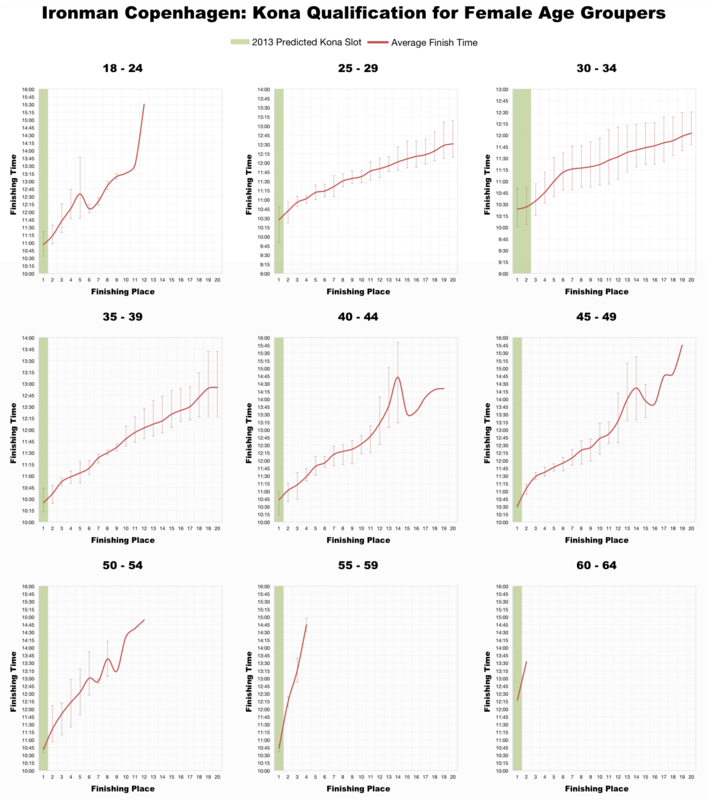 For men a 9:15 looks necessary below the age of 40 and still faster than a 10:00 up to 55. 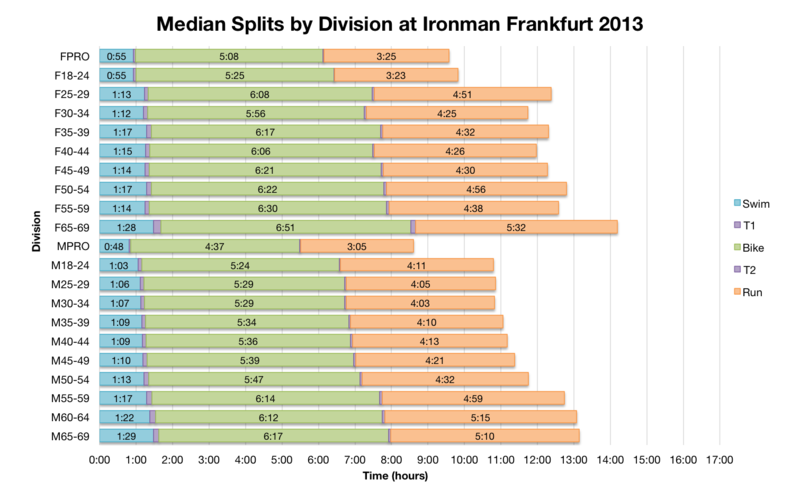 The drop off in finishing time is relatively rapid though so the competition at the front is not as tight as Frankfurt for example. 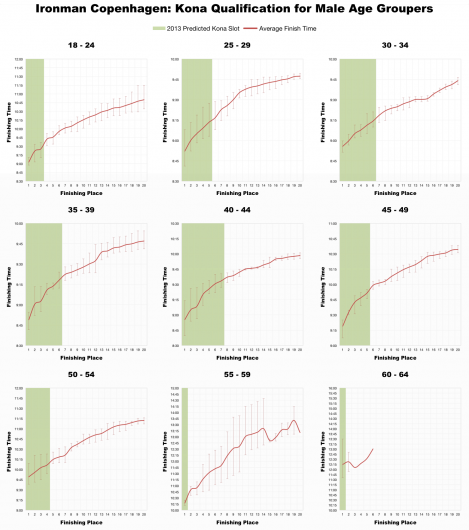 Women will need to win their age group making it far hard to suggest times. The previous winning times generally seem strong, but not the fastest seen in European racing. The same race, but a different brand. Whether this affects the event at all remains to be seen. The addition of Kona slots appears to be the only major change that might have brought new athletes into the mix. 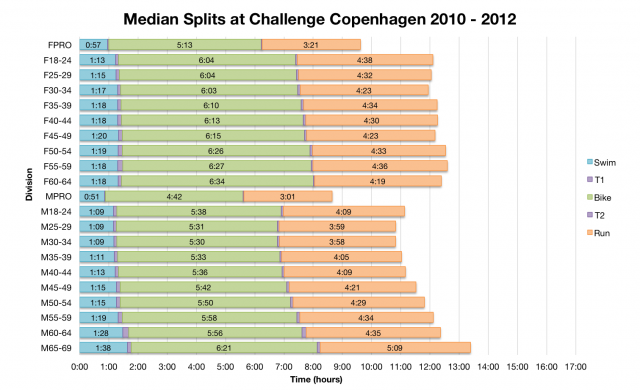 Copenhagen was already a fast race, but the front of the field may have got more competitive.